Welcome to the winter edition of Tandem Talk. I hope you are staying warm and dry and managing to get out for a ride or two on the cool, crisp days. Here’s a bit of a run-down on what’s been going on in the world of WATCAC. 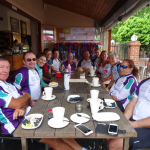 The April Rec Ride saw 4 tandems and 4 single bikes ride from VisAbility to Nedlands and the revamped tea rooms on Matilda Bay. This is a lovely ride along the South Perth Foreshore and the path alongside Mounts Bay Road, where it’s not uncommon for us to spot a dolphin or two. In May our Mother’s Day ride saw several family groups join in the ride before meeting Mum for lunch. Five tandems and 3 singles cycled from Bayswater station, over Windan Bridge and along the South Perth Foreshore to the Narrows Bridge. We stopped for coffee at the Bell Tower before heading back to Bayswater. Unfortunately, the June ride was cancelled due to poor weather. Hopefully we will have fine weather for a repeat attempt this Sunday (10/7). 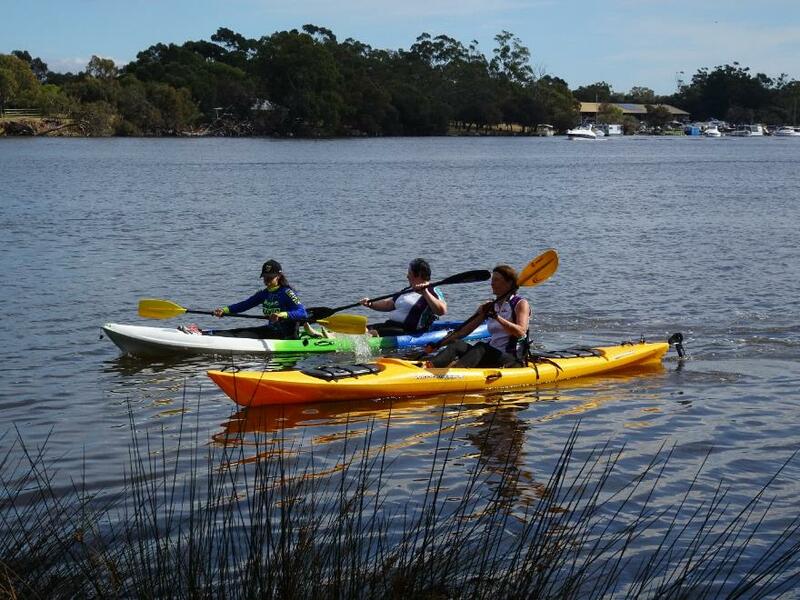 Join us at Bull Creek Train Station at 9:00am for a ride along the Canning River to Kent St Weir. Let me know if you need help with a bike and/or pilot. In April one ride was replaced with the Freeway Bike Hike and the second ride was cancelled due to rain. In May there was one ride from Guildford, following Tonkin Highway through the new Gateway Project to Roe Highway. 3 tandems and 2 singles participated, with some riders returning via the Armadale train line and the more adventurous coming home via the Kwinana Freeway. 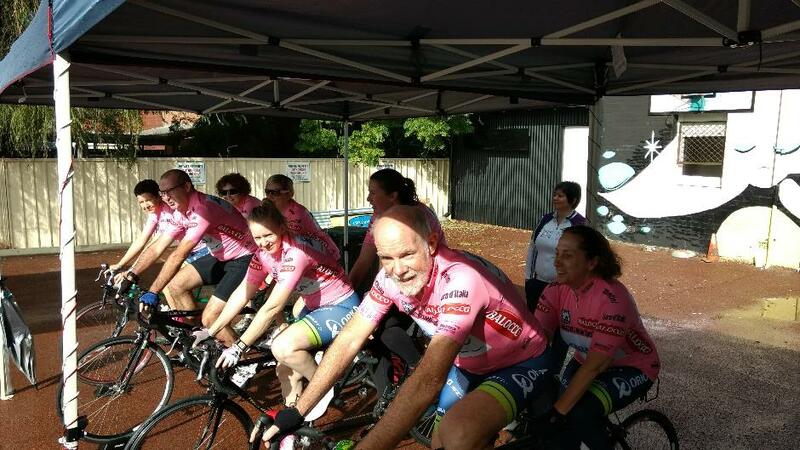 The second May ride saw WATCAC members participating in the Armadale Grand Fondo. The first weekend in June saw 3 tandems and 4 single bikes complete the Tonkin/Roe loop from Guildford. The second ride in June was much depleted due to injury and illness but the few of us remaining did a shorter ride from Vic Park. This turned into a fairly wet ride, not due to rain, but because of flooding underneath the Causeway that was deep enough to soak our shoes. Thankfully we only encountered this at the very end of the ride. This morning a small group headed out from Vic Park while those in the know stayed home and out of the rain. Our next club ride is scheduled for Sunday 17th July. Adriana and Paul, Erin and Trevor, Deanne and Jennifer with David and Forest took part in the Freeway Bike Hike this year, starting out from Elizabeth Quay as the sun came up to do the 60km route. It was great to be part of this community ride. To ride on the freeway is exhilarating, and fast – lots of wide road and no bollards or cross roads to worry about. What really struck me was how quiet the freeway was, even with one direction still open to traffic. Crossing over Mt Henry Bridge, on the top side, as the sun came up over the Darling Scarp was magical. 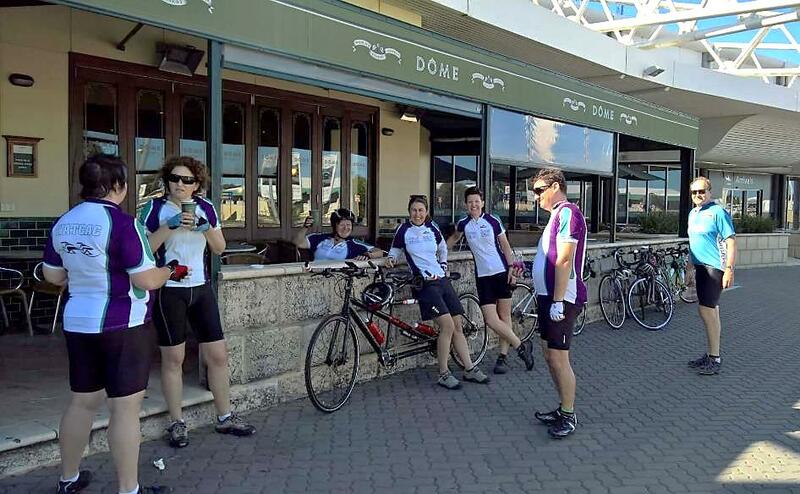 At one point, as Deanne and I were heading back towards Perth along the Mitchell Freeway, the pack had stretched out and there was no one in front of us and no one behind us, so that we couldn’t tell that we were part of an organised bike ride. We both had a little moment of questioning what we were doing – cycling down the middle of the freeway! Surely we should have been on the path? It’s been a few years since I have participated in the Freeway Bike Hike but I found the event to be well organised. Because of the staggered start times we didn’t see the riders participating in the shorter distances. This meant that we weren’t spending half the ride trying to avoid slower and less experienced riders, making it much safer. Put it in your calendar for next year. 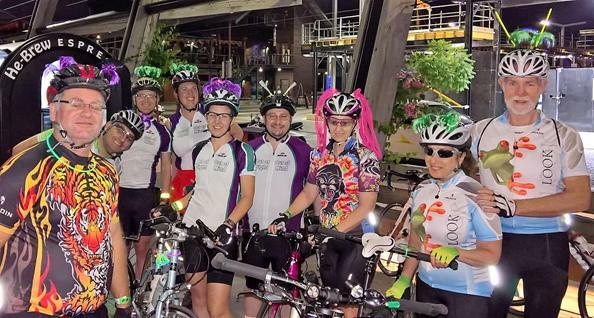 A relatively new event on the calendar (this was only the second one) the Bridges Night Ride for MS is a community ride run by Perth Integrated Health Cycling Group (PIHCG). Run on a Friday Evening the emphasis is on having a fun, sociable ride while raising some money for a good cause and enjoying some of the most picturesque parts of this city. 10 WATCAC members (3 tandems and 4 singles) took part in this year’s event. Setting out from Centenary Park in Waterford we meandered around the Canning and Swan River, completing a distance of 40km. Everyone had put as many lights as possible on their bikes, with some even digging into the Christmas decorations (Sue). Once again we found ourselves at Elizabeth Quay, where we stopped for a photo op, and managed to win a voucher for dinner at Sopranos Italian Restaurant in South Perth. 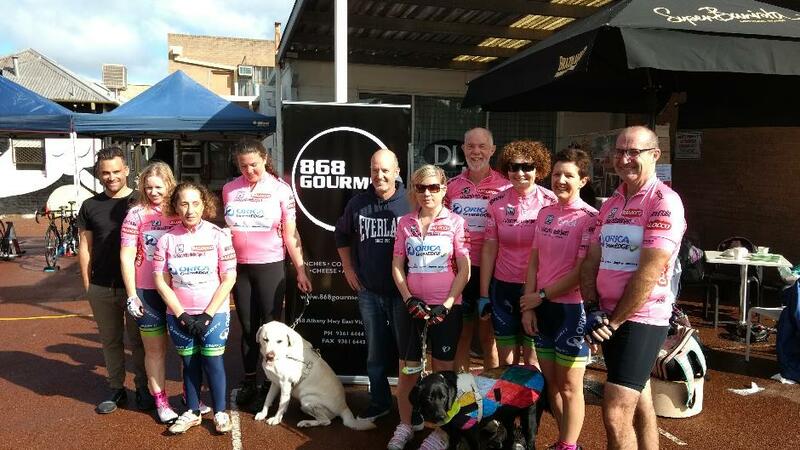 Bribed with our dinner voucher, PIHCG twisted our arms into joining their Armadale Grand Fondo. A timed event, Erin and Roz, Deanne and Jennifer and David opted for the 40km piccolo route down on the flat while Anthony, Haylee, Paul and Forest took on 80km of hills. 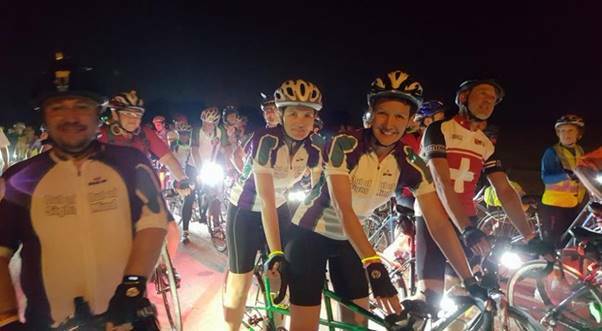 It was really heartening to see a group of about 20 riders use this event to “graduate” from the She Rides course, a Cycling Australia initiative aimed at encouraging and coaching novice, women bike riders. Both PIHCG events were very well organised with a lot of attention to rider safety. I would encourage you to consider entering any of their events that suit your ability. Membership: Is Your Information Up To Date? Do we know how to contact you to keep you informed of rides and events? More importantly, do we know who to contact in the event of an emergency (or a minor bingle)? We are currently updating all our membership data and contact information, including Emergency Contact information. If you who haven’t yet done so, please fill in your details on the attached WATCAC Membership form and email it to watcac@googlegroups.com or hand it to a committee member. A copy can also be downloaded from our website under About >> Membership, or click here: watcac.org/about/membership. Hopefully we will never need to use your next of kin information, but the issue was highlighted recently when one of our most experienced and competent members tangled with a pedestrian while out on a ride. Despite alerting the pedestrian to his presence she still stepped out in front of him, leaving Anthony with broken bones, cuts and bruises. We all wish Anthony a speedy recovery and hope to see him back out on the bike soon. There are a limited number of WATCAC jerseys still available for purchase, so if you didn’t get one the first time around, or yours is worn out, $60 will get you a new one. Trevor the Treasurer has done the budget, and like budgets everywhere, we are in deficit. Maintaining a fleet of tandems (and the trailer) to keep them safe and in good working order, unfortunately costs money. While some of our members help out by selling chocolates (lots and lots of chocolates) our expenditure is still forecast to exceed chocolate consumption. In particular, we are planning on upgrading the WATCAC website to make it more accessible and a better tool for attracting new members and keeping you up to date with what WATCAC is doing. The committee has been discussing various fund raising options but we would like your ideas. Have you come across a successful fund-raiser? Would you prefer to help out and support a movie night, a quiz night, a raffle or something else? Let us know. Welcome to the final edition of Tandem Talk for 2015. There’s been an awful lot going on the last few months; great weather, Bike Week and more, so you may want to get yourself a cuppa before settling down to read this one. 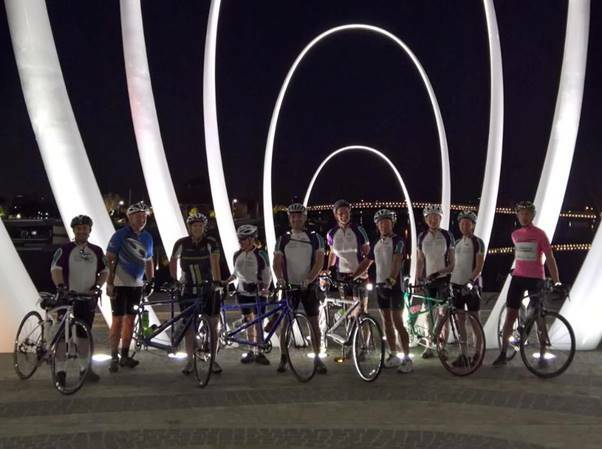 The September Clinic was clearly a success as there have been several new riders join our rides and hire tandems. New member, Kate with workmate Roland volunteering up the front, have been riding regularly since they attended the clinic and Erin has shown herself to be an extremely versatile stoker, partnering with five different pilots at last count. In September (1 tandem, 5 singles) and October (3 tandems, 4 singles) we cycled from VisAbility to Matilda Bay, with the more adventurous extending the ride to the jetty at Steve’s before turning around and coming back for coffee. The October ride was a great turn-out considering the Blind Citizens Conference was on, and it was great to have Nathan and David join us. 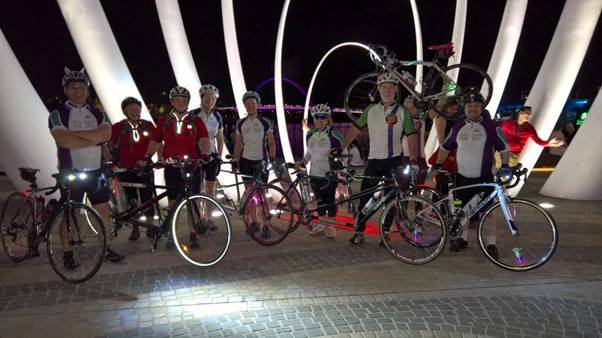 The November Rec Ride was remarkable on two fronts – the tandems outnumbered the single bikes 5 to 2 AND the girls outnumbered the boys 8 to 4! Needless to say we turned some heads on our ride from Guildford to Oasis and back. I have to add that the boys, (or should I say men?) made up for their lack of numbers when Ian’s front tyre suffered a blowout and Ian, Paul and David pooled their resources (I was going to say “pulled out their tools” but that would be wrong!) and MacGyver-ed a fix on the side of the road involving a found, plastic water bottle and a deal of ingenuity. Most of us are used to seeing the bemused looks on the faces of the people we pass and hearing “there’s a tandem… and another… and another!” but the shoe was on the other foot so to speak, when our group passed 4 tandems going in the opposite direction! Somewhere out there, there are other tandem riders as surprised and as startled as we were by this discovery. There was only one Club Ride per month for September, October and November due to the number of other events on. In September 4 tandems and 4 single bikes tried out a new route through Nedlands and Claremont. In October we tried to finesse this, but realised we got it right the first time. 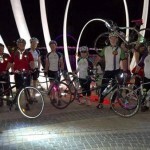 In November 4 tandems and 4 singles braved the heat to head out on the ride through the Middle Swan and Bellevue. I only just discovered that this circuit is called “Thomas the Tank”, because it crosses 5 train lines. Did I mention there’s been a bit on lately? To name a few, in October we had members involved in Ride for a Reason, Ride to Work, MS Ocean Ride and the Gravel Grinder. 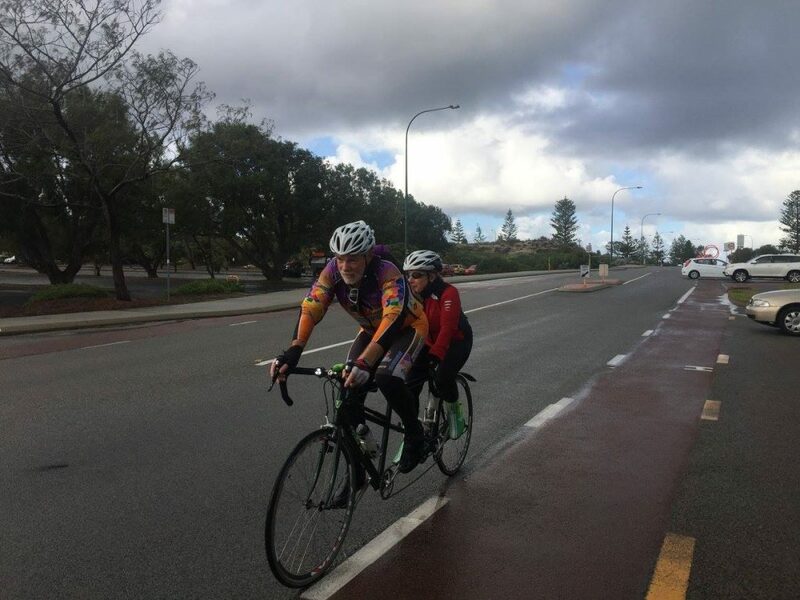 While Kate and Roland joined the ‘short ride’, taking in part of the Shelly loop for coffee back in Perth, Beau cycled all the way to Bunbury and was back in Perth in time to walk 12 km in the Rotary Ramble the next day. To be fair to Roland, he jumped onto his commuter bike and did another 135km that day, taking the long way home. Deanne and I have discussed participating in the Ride to Work day for several years now, and this year we made it happen. Thankfully her workmates were suitably impressed with our 7km ride from Vic Park train station to North Perth, via the Concert Hall for a free breakfast – which is what it’s all about right? A light drizzle made us look sufficiently hard-core as we were fairly soaked by the time we got to Dee’s workplace. Next year we will plan to leave earlier (more breakfast), and from a more distant train station (more ks). The MS Ride is a regular event and WATCAC was represented once again – Callum and Paul M took on the 70km challenge, including Reabold Hill and a few other lumpy bits. Deanne and I and Forest did the 50km ride. We chalked it up as a good day, as for the first time in 4 years we didn’t get swooped by maggies or rained on. This event is well organised and marshalled, and there is a 30km option that is very do-able should you be considering participating in a community event. 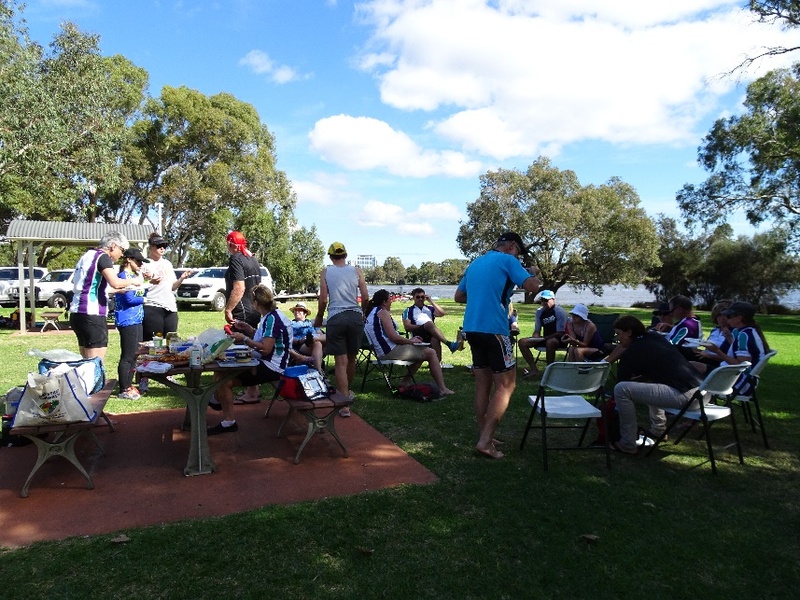 On the same weekend, WATCAC members, Adriana & Hab, Paul & Jo, Haylee and Paul H travelled to Moora for the Grave Grinder Challenge; 52 km from Moora to Watheroo. This is a big event for the town and they all turn out in fancy dress to cheer riders along at the water stations. Jo, Adrianna and Haylee shared the podium for the best women’s times on the day. This event, which includes a huge dinner, wins the best value for money prize. Finally, while I write this, more of our members are participating in the Santos Great Bike Ride, cycling 52km around the Swan River, including on the Kwinana Freeway (not the bike path) from Canning Highway to Riverside Drive. Well… I say “while I write this” but it is now midday and they are probably all at home having a well-deserved rest. I was lying in bed listening to the wind blowing a gale outside my window when they were riding. Next Sunday, 29th November, WATCAC will be hosting a “Have A Go” day for Retina Australia at Whiteman Park from 9:00 to 12:00. If you can volunteer as a helper or pilot for this event please email WATCAC@googlegroups.com and let us know. What a fabulous weekend! Great company, great food, great weather and lots of cycling! Fifteen members with about twice as many bikes enjoyed three nights in Busselton – yes, the bikes enjoyed it too, with a ride to Peppermint Grove Beach (57km return) on Saturday, Simmos’ Ice creamery via Dunsborough (59km return) on Sunday and on Monday some of the more adventurous headed out to the Dunsborough MTB Skills Development Park at Dunsborough and Districts Country Club. Rumour has it that they accidentally ended up on the blue (read advanced) trails. Jo, believing that all good Country Clubs should have a spa, applied her own mud facial while out on the trail. Thank you to Jo and Paul, who put in the hard yards (quite literally) to plan, organise and personally check out the accommodation and the rides for us. WestCycle are calling on people who ride bikes, people who drive and people who would like to ride more but are concerned about safety to complete the Bike Safety Survey. The Bike Safety Survey is the result of over 12 months engagement work between WestCycle and our member organisations. Together we have identified 10 measures needed to make it safer to ride a bike in Western Australia and we are now inviting the general public to help prioritise what the most important measures are. “This survey is for everyone – the people who already ride bikes, people who drive cars, people who would like to ride more but are concerned about safety. 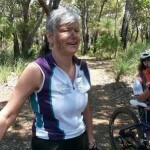 We’d like everyone to input into finding solutions to make Western Australia a bike-friendly state”, said Mr Fulton. Have you completed the Bike Safety Survey yet? This is your chance to share your thoughts on how riding a bike can be made safer in Western Australia. Go to https://www.surveymonkey.com/r/bikesafetysurvey2015. The survey closes at 4pm on Monday 23rd November – that’s tomorrow! The WATCAC AGM is scheduled for Sunday 13th December. We will start with a Rec Ride from David and Jennifer Musgrave’s home, 52 Sutherland Cres, Winthrop to Kent St Weir returning to Winthrop for the AGM at 11:00. This will be our final ride for 2015. Check your email for further information. WATCAC doesn’t run without a dedicated group of volunteers, and you may recall that last year our then President stood down and wasn’t replaced. Anthony (Hab) has been filling in as Acting President but is unable to continue in this role. If you are able to give a few hours a month to help co-ordinate rides and keep the wheels turning please consider nominating for a committee position. Any of the current (and past) committee members would be happy to talk to you about what’s involved.